Why is volatility in stocks falling while it's rising in fixed income? 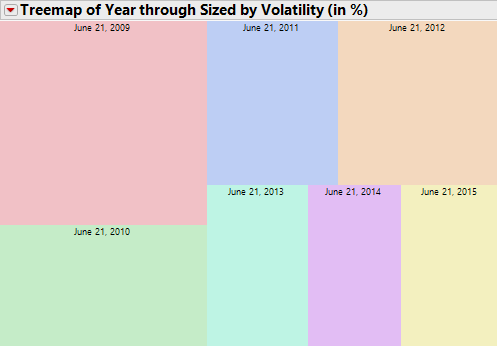 Where has all the stock market volatility gone? U.S. equities have been surprisingly quiet the past three years. There hasn’t been a one-day change of 2 percent or more in the Standard & Poor’s 500 Index since December, Bloomberg News reported. Data compiled by Bloomberg and Deutsche Bank AG note that this is the longest such streak since February 2007, when 164 trading days passed without breaching the 2 percent threshold. Even more surprising is the lack of 1 percent moves. Eight weeks have passed without a change of that magnitude in the S&P500. “That’s the longest such streak we’ve seen in 21 years,” Business Insider reported. It isn’t for a lack of catalysts: investors are awaiting the Federal Reserve’s first interest rate increase in nine years; the Greek debt saga continues to cause troubles in Europe; China’s booming stock market shows signs of excess; and the Middle East remains a disaster. My colleague Michael Batnick, writing at the Irrelevant Investor, notes that people searching for volatility are looking in the wrong places. Instead of watching stocks, he suggests looking at bonds. Why is volatility in stocks falling while it’s rising in fixed income? A leading candidate for this is the probability of a Fed interest rate hike. There has been a minor exodus from bonds based on expectations for an increase in rates in September or December (or both). The four-week moving average of bond flows is the most negative since the so-called taper tantrum of two years ago, according to a recent report from Bank of America Merrill Lynch. The lack of clarity — and not the dreaded and often-misused “uncertainty” — seems to be the most commonly given explanation. Perhaps this will change during the lazy days of summer: when trading volumes fall, equity markets might get more easily pushed around. For now, enjoy the low volatility. Once the summer ends, if rates start to rise and volume increases, you may be pining for these days without drama. This column does not necessarily reflect the opinion of Bloomberg View’s editorial board or Bloomberg LP, its owners and investors.